Scouts from Premier League side Crystal Palace reportedly had a very special mission last Friday. As reported by newspaper A Bola, club emissaries have been in the North of Portugal to watch the league match between Boavista and Chaves. That’s a mid-table clash that English clubs scouts are not used to watching, and even Manchester United, who have officials at most of the Portuguese league games, haven’t attended this one. 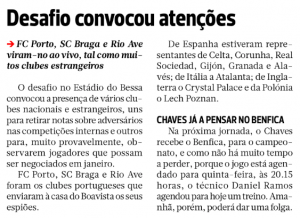 So we can only guess that Crystal Palace have a target at either Boavista or Chaves because it’s unlikely they’d be doing general scouting there, although A Bola doesn’t seem to know much about it. What the Crystal Palace scouts watched was a very good away win from Chaves, with goals scored by Marcão and an own goal from Boavista goalkeeper Helton Leite. Rochinha scored for the home side in the second half, but that wasn’t enough for a reaction. Despite the own goal, Helton Leite had a good match, stopping Chaves from scoring a third. His teammate Fabio Espinho had a fine performance as well, making an assist for their goal. For Chaves, left-back Djavan had an impressive performance, creating several attacking plays. Paulinho, Maras, Macão and Ghazaryan were all praised by the local press as well. Other clubs who had emissaries at this match were Celta Vigo, Deportivo La Coruña, Real Sociedad, Sporting Gijón, Granada, Alavés, Atalanta and Lech Poznan.